Len Greene Jr. (right) will take over his father, Len Greene Sr.'s, seat for the 105th House District. Fatherly pride shines through as Len Greene Sr. talks about his son, Len Greene Jr.’s winning bid for the 105th District seat at Connecticut’s House of Representatives. “He really ran a good campaign. I think he resonated with the voters with his message. It’s really one that is applicable throughout the state. We really need to trim the line, tighten out belts, and be more fiscally conservative as a government, because that is what everybody else is doing in their households,” said Greene Sr. The apple doesn’t fall far from the tree in the Greene household. Greene Sr. served as representative for the 105th House District from 1997-2008. Both father and son grew up in Beacon Falls. “Growing up in a household that was, you know, very involved not only politically but just in the community in general, it obviously influenced the way I think about things now and my political views in general,” said Greene Jr.
Greene Jr. and Sr. agreed that the only place where their philosophies differ is on lawn maintenance. “I think he reflects a lot of what I did. We’re very very similar in our philosophy and, you know, our political views. You’re always a father. You’re always there for advice. You’re always there for support. And that’s what I’m looking forward to,” said Greene Sr.
Greene Jr. was a junior in high school when his father was first elected as state representative, but Greene Jr. didn’t pay much heed. “I paid attention a little bit here and there but you’re wrapped up in your own little world when you’re in high school. It was more when I got to college that I started paying more attention, especially my later years of collage,” said Green Jr.
Greene Jr. became more interested in politics when interned with the legislature in 2002 for Senator Win Smith of Milford. “I guess that kind of injected me into the system a little more. It was a great opportunity as an intern and I learned a heck of a lot while I was there,” said Greene Jr. 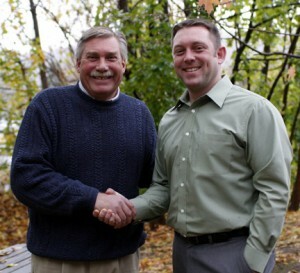 In 2006, Greene Jr. worked with his father on the Environment Committee. “It was great to see my father actually doing his job,” said Greene. Now that Greene Jr. has taken over his father’s position, he has his own plans for the environment. “One thing that I’d love to see, and I know my dad worked very hard on when he was there, is maintaining the integrity of our towns, doing things like open space preservation…It’s vital in my mind…to make sure we don’t overstep our bounds and to preserve what we have historically and also environmentally,” said Greene. There have been tremendous advances in environmental policy since Greene Sr. was younger, he said. “When I was a kid growing up here, the river changed colors depending upon what color dye they were dying the sneakers over across the river…We have fish in the river now. I never dreamed that that would occur,” said Greene Sr. Seeing his father in action gave Greene. Jr. an appreciation for the long hours his father worked and his sparked his interest in government. “It gives you a different perspective because when you’re a kid, you might see it on CTN or on TV or you’ll read it in the newspaper, but it’s another thing to actually go there and see the day-to-day operation,” said Greene Jr.
Greene worked as a clerk on the Government Administration and Elections Committee as well as a legislative analyst for the House Republican Caucus. “He was one of the people that we as legislators would look to for our knowledge and our assistance. He’d sit in committee meetings that some of us weren’t privy to because we were involved in other things,” said Greene Sr.
Greene Sr. said that his son had an advantage over other new representatives because of his previous experience working in the state capitol. “Len’s going to be in kind of a unique position as a freshman legislator because not only is he my son and kind of grew up with it; but also, he’s been in the process… He’s actually got that basic knowledge and his contacts that many of the new freshman legislators going in aren’t going to have,” said Greene Sr.
Green Sr. said he would be on hand to give his son historical perspective on reoccurring issues. “I can look back at something as say, ‘Well, jeez, in ’98 we did this change and now they’re trying to change something else similar,” said Greene Sr.
Greene. Sr. urged his son to remember to consider all the ramifications of his decisions before voting. “There’s a cause and affect for everything we do up there, whether it be the environment, or the budget, or anything…You always have to remember that you are a representative. You’re not someone who’s out for their own agenda,” said Greene Sr.
As a representative, you must always ask yourself whether are decision is good for the district and for the state of Connecticut, said Green Sr.
“It’s really easy to vote for something that’s real green. This is a great thing, but you really have to go deeper,” said Greene Sr.
“As much as I might believe in my opinion on an issue, the person that has a different viewpoint believes just as much in their opinion. And therefore, you have to realize that and understand that there’s always a chance to compromise. There’s always a way to meet in the middle,” said Greene Sr.
“In the legislature, your word is your bond. And that’s how you get perceived. That’s how your reputation is. And if you commit to something, then by all means you commit to that, not only up in Hartford but in life,” said Greene Sr.
Greene Sr. warned his son and his son’s wife that the position is grueling, but it’s worth it. “It’s very difficult on a family,” said Greene Sr. However, “I got to do a lot of things that I’d never thought I’d get to do,” he said.